Here are some unpublished photos that I shot last Spring featuring this amazing City Of Saints skirt .It was simply too beautiful not to share! I color blocked this outfit with vibrant tones coordinating the shoe and bag to pull the look together. 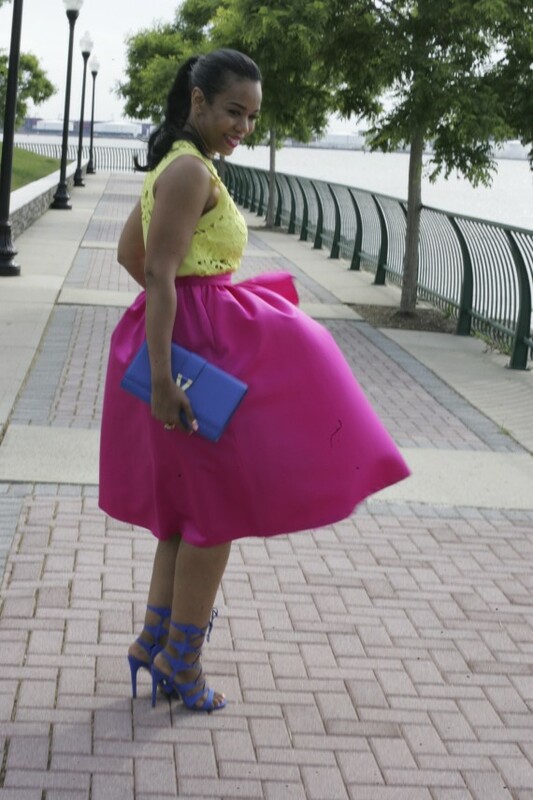 Color blocking is a quick easy way revamp your look and transition into spring with bright lively tones. The first weekend of Spring and I am still wearing a fur!I know I can’t believe it either but winter is putting a up a fierce fight and does not want to leave. I created a boho look layering color and popping a bold scarf pattern to pull it all together. When I don’t want to think about getting dressed but still have to look pulled together,I pull out a trusty tunic dress. It’s the easiest way to get out the door without giving your look a second thought. Here I popped a fun color clutch and vintage tie boots for added interest. It’s amazing what you come up with when you have no time to dwell over an outfit!